It seems SLINK64 is not able to load HHCTRL.OCX. Unless you are using a version of SLINK64 that is quite old, it will have the ability to read .ocx files so I suggest that you check that you are loading a 64 bit ocx file and not the corresponding 32 bit file. 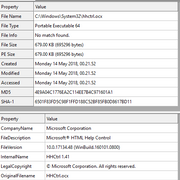 I found that HHCTRL.OCX was not the 64 bit file. I changed it and now it is working. I am using FTN95 8.30. For some reason, I am still not able to load the HHCTRL.OCX file, I am loading from c:\windows\system32\ and I checked with CFF explorer that it is indeed a x64 file. My Slink64 version is v2.05. v2.05 of SLINK64 will load HHCTRL.OCX. How are you loading it and what is the error message? Are you using a script or the command line? I tried either way, it still fails. By the way I still have to use the @ in front of slk files in 64bit, hopefully this will not be necessary in the near future. well that worked. I didn't try that (from earlier posts) because I saw I didn't have the c:\windows\sysnative folder and so I didn't bother trying it. Out of curiosity, what does it stand for? I guess that there is something in the Microsoft system (and/or libraries) that performs the appropriate redirection.